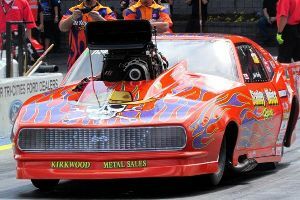 Todd Tutterow put down the fastest pass ever in Pro Mod at the Shakedown with a 5.98@262.49 MPH run which far exceeds the previous record held by Melanie Troxel of 258.71. 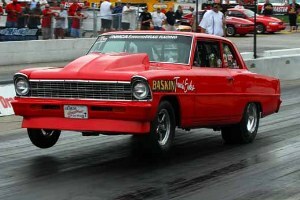 “King Tut” was running the new Neal Chance All Billet Lockup Converter which helped him lay down a 67.5 MPH Backhalf!!. What’s Todd say about the new Lock Up Converter? “Perfect – we’re going 270 soon!! !” He also told us that he had to peddle some on that pass, which certainly scrubbed a little off. The Precision Turbo Duster is going to be a dominate force to reckon with and everyone can see the potential that is right around the corner. Todd had troubles in Round 2 which ended his day early, but we hear tell the scoreboards are still smoking after that record breaking pass! Also in Pro Mod, Camp Stanley was in the house and their team made it’s first trip to the 3.50’s zone! John went 3.59@201 after switching to the NCRC All Billet Converter! They went straight from the 3.70’s to the 3.50 zone which was quite a move. Incremental’s were .927, 2.41, 3.59@201!!! There’s a good video of the pass if you want to see the latest member to the 3.50 club make his pass on YouTube. We’re looking forward to seeing how the team does in Dallas at the ADRL finals. Congratulations Camp, John and team! In Outlaw 10.5 Charlie Dolbin and Harold Caldwell set a new N2O record of 4.18 in competition, and backed it up with a 4.22. In the final Charlie shook the tires giving Rob Wells the advantage to take the win. TJ Kasper was also running very hard laying down another 4.08 this time at a paint blistering 201.25 MPH – Congratulations to TJ, Tom and Gil Christy Motorsports on backing up Outlaw 10.5 Record and a new MPH Class record! We’re glad to Richard Sexton and Gil Mobley got the GTO repaired and back in action! The team isn’t quite back up to speed, but after a nasty wreck we’re sure there are a few things to work out and we’re glad they are back! In Heavy Street Tony Presto made the long haul down from Canada and was rewarded with a co-win along with Mitch George driving Jack Boer’s Monte Carlo. Due to an early curfew at the track, the final wasn’t actually ran so the “all NCRC” final round couldn’t be ran. Presto & George split the win and took home $5000 each. 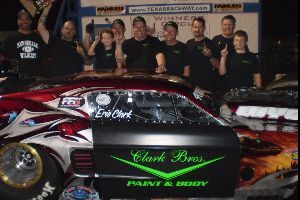 The Clark Brothers Racing Team has been on a winning streak here at the end of the season. 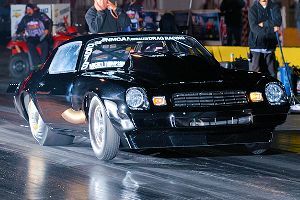 Eric Clark won the Texas Auto ProMod race in Houston October 7th and set a new class record of 4.05! Then the Team repeated with their first TOPMA win on October 13th at Texas Raceway. Eric was #1 Qualifer with a 3.962@183 and defeated Tim Cruce in the final with a 4.003@183 over Cruce’s 4.267@170. Next they worked on capturing a 3rd in a row by jumping in the rig and heading north to grab the final day of the Throwdown in T-Town which was on rain delay, but some broken bolts on the input shaft stopped them short in their winning streak. We all know how that kind of thing happens, but you guys gave it a shot and that’s what counts. Congratulations to Eric, Scott and Team Dusty, Ken, Robert and Kevin (hope we got everyone) on the wins and new record! Summers & Baskin Take Home Wins, Carlyle 1st to 6’s!! The NMCA Season Finals at Indy were off the hook for Neal Chance Customers!! Starting it off was Steve Summers in Mickey Thompson Super Street who won his first ever NMCA event after defeating Mr. Willard Kinzer, Mark Micke, and Ed Parker in the final round! That’s some tough competition but he was certainly up to the task! In the finals Steve ran a 6.59@214 over Ed’s 6.87 to take the win. Steve recently upgraded to one of our All Billet Converters and has gotten some extra help from our Dealer Dave Klaput over at Proformance Racing Transmissions getting the combo dialed in… Thanks Dave! Congratulations Steve and welcome to Team NCRC! Don Baskin qualified #1 with a 8.37@159 and defeated Andy Schmidt in the final round of Comp Cams Pro Stock. That’s Don’s 4th win of the year in Pro Stock and we’re pretty confident he has enough points to take the season championship for 2012! Congratulations and the race win and very strong performance all year long Don!!! Mark Carlyle flat lit them up in the Chevy Performance LSX Shootout which is ran at the same time as the NMCA Finals. 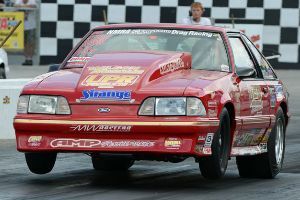 Mark recorded the very first SIX second pass by a LSX Drag Radial Car when he ran a 6.99@211 in the semi’s. He went on to Runner up in the final against Mark Brown. Brown got out on Carlyle which despite having a better ET of 7.09 he couldn’t make up the difference when Brown went 7.19. 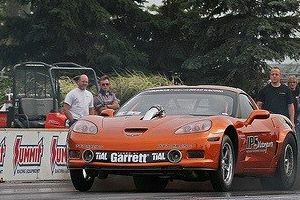 Carlyle’s ZO6 Vette still retains the IRS rear suspension which makes it also the World’s quickest IRS equipped car. Mark along with Patrick Barnhill, Tomi Lane and IPS Motorsports have figured out how to make the car work, and work it does laying down 1.19 60′ times! Congratulations Mark on the new record setting pass and for your Runner Up! Mark Carlyle wrote in to let us know how well he liked his new Neal Chance Bolt Together Converter. 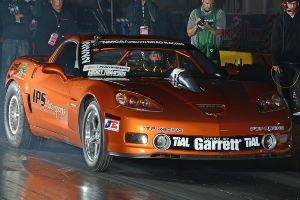 Mark blew away both the LSX Drag Radial Record AND the Stock Suspension Corvette Records when he laid down a 7.107@211.53 (4.74 660′) at Norwalk Raceway Park September 22nd. Mark was racing the Lingenfelter Performance Nationals and broke the record during the 3rd round of qualifying. 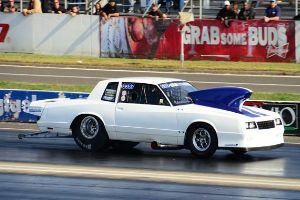 Mark ran and even quicker pass in the first round of Outlaw Drag Radial when he went 7.094@212. He went on to win in the final over Ray Litz, from what we hear that run wasn’t pretty but he got the win! Congratulations Mark, Tuner Patrick Barnhill and IPS Motorsports on the win and new records! 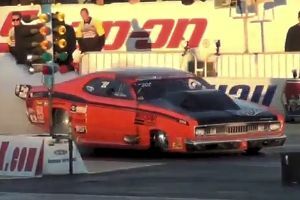 Rick laid down the record setting 8.388@159.59 pass when he went up against fellow NCRC competitior Mike Demayo in Round 1, and defeated Tim Eichorn in the final round. Congratulations Rick & Dennis on the new World Record and Race win!! 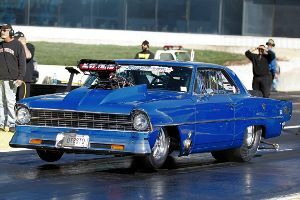 Charlie Booze Jr. edged out Don Bowles for the 2012 Hot Street Season Championship! Charlie worked hard to seal the championship, they even changed out the engine at Bowling Green using a Forklift! 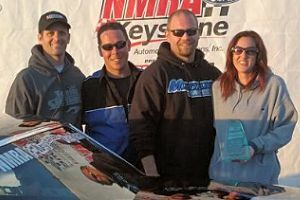 Congratulations Charlie on your NMRA Championship!